Care2 Healthy Living | Chia Seeds vs. Hemp Seeds: Which Are Healthier? Chia Seeds vs. Hemp Seeds: Which Are Healthier? Chia and hemp are both packed with healthy vitamins, minerals and fiber, but is one healthier than the other? 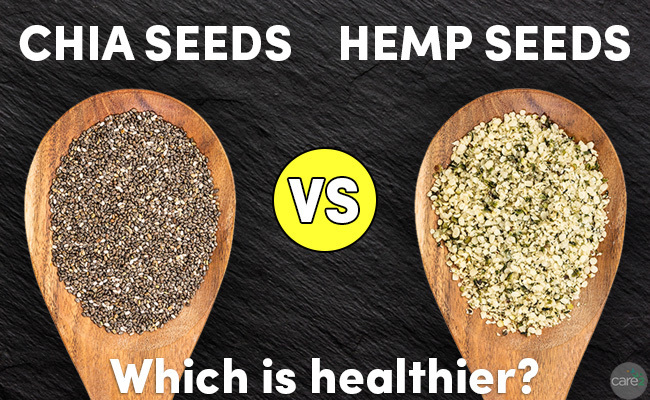 Let’s a take a side-by-side look at chia seeds vs. hemp seeds. To dive into the nutrient counts of chia seeds vs. hemp seeds, I used my favorite nutritional information resource: SELFNutritionData. It’s great for looking up the nutritional information of almost any food. I’m going to lay out some key differences between chia seeds and hemp seeds below, and I also created a graphic that you can share, if you prefer getting information visually. A one-ounce (two tablespoon) serving of chia seeds contains four grams of protein and 11 grams of dietary fiber. That’s over 40 percent of your daily fiber needs, and those two tablespoons only add 137 calories to your day. Like most seeds, chia seeds are high in fat, which isn’t necessarily a bad thing. Healthy fats, like those found in seeds, nuts and avocado, are essential for health. It’s just a matter of moderation. That serving contains nine grams of fat, which isn’t surprising. I was surprised to learn that one gram of that fat is saturated. A serving of chia gives you four percent of your daily saturated fat allowance. If you’re eating an otherwise healthy diet, this is not a big deal, but it’s something to keep in mind if you’re watching your saturated fat intake. Chia seeds are also a good source of calcium and phosphorus, with 18 percent of your daily calcium needs and 27 percent of your daily phosphorous in a serving. Phosphorous works with calcium to build healthy, strong bones and teeth, so chia seeds are a great food to eat for dental and bone health. They’re also a very good source of manganese, an antioxidant that supports healthy metabolism, bone health and wound healing. A serving of chia provides 30 percent of your daily manganese. This is important to note, because it is possible to get too much manganese. If you’re taking a manganese supplement, chia seeds may not be the best dietary choice for you. To provide a fair comparison, let’s also look at a one-ounce (two tablespoon) serving of hemp seeds. Two tablespoons of hemp seeds provide 10 grams of protein and four percent of your daily fiber needs. Like chia seeds, hemp seeds are high in fat (13 grams per serving), and they do contain that same one gram of saturated fat. Hemp does not provide any calcium, but unlike chia, it is rich in iron. One serving delivers 15 percent of your daily iron requirement. It also gives you 45 percent of your daily magnesium, another mineral essential to bone health. That means that both chia and hemp seeds help support healthy bones in different ways. Hemp seeds contain three times as much zinc as chia seeds. In that one-ounce serving, hemp seeds give you 21 percent of your zinc requirements for the day. Zinc is an important mineral, but it is also possible to take too much zinc. If you’re taking zinc supplements, including many over-the-counter immune support supplements, make sure you’re not overdoing it in the zinc department. So, which is healthier: chia seeds or hemp seeds? Really, the answer is that they are both extremely healthy. Variety is the cornerstone of a healthy diet, so mix it up! Put chia into your oatmeal today, add hemp seeds to your smoothie tomorrow. Which Seed is Better: Chia or Flax? Image Credits: Photos via Thinkstock. Infographic by Becky Striepe.